Ford has launched the second generation Figo hatchback, which promises to be packed with equipment, safety features and looks a lot better than before. However, the compact car market has undergone a complete change in the recent past. Can the all-new Ford Figo carve a niche and recreate history like it did when it was launched six years ago? Last month Ford impressed us with its compact sedan Figo Aspire and its unbelievably aggressive pricing. Now the American car manufacturer is back with its smaller sibling, a popular name in the hatchback segment – the Figo. This one too carries a cutthroat price to please the masses. We drive it on the streets of Delhi to find out if it is of any match to competition and the tall order set by its predecessor. In terms of looks, the face of the Ford Figo hatchback seems identical to the larger Figo Aspire sedan. It has similar 4-slat chrome grille and an identical bumper up front. And we aren't really complaining as we love the bold stance of both these cars. At the back though the story is a bit different. While it doesn't look disproportionate, the rear styling can not match the aggressive design of the front of the car. In profile though, the Figo with its sharp shoulder line and the distinct character line looks pretty neat. However, we would have loved better looking alloys. The Figo has been launched with three engine options. The 1.2-litre petrol unit makes 88PS and 112Nm and comes mated to a 5-speed manual transmission. Ford also has a larger 1.5-litre petrol on offer which is only offered with a 6-speed dual clutch transmission. This unit makes 112PS and 136Nm. And lastly, there is also a 1.5-litre diesel, churning 100PS and 215Nm. The diesel unit feels punchy and and has enough torque coming in lower down the rev range to make overtaking extremely easy. In the mid-range too the engine feels energetic but push it a bit more and the noise starts seeping into the cabin. The gearing is well sorted even for city use, but shifts could have been more effortless. We also drove the 1.5-litre automatic variant of the Figo and found it to be a bit lethargic especially in the D mode. Although the S mode allows the engine to be pushed closer to the red line, with all the noise seeping in the cabin it is clear that the engine doesn’t like to be revved too hard. The shifts however are fairly smooth. From inside the car, visibility all round is decent and I say that simply because the fat A-pillar can take a little getting used too. That aside,thanks to the height adjustable driver seat, it is easy to find the right driving position. The clutch is fairly soft making it easy to drive in city traffic conditions. We also didn't like the positioning of the ORVM controls and the button to open the boot lid; rest all buttons are well within reach. The suspension is setup slightly on the stiffer side but surprising the Figo manages to deal with bad roads and undulations with fair poise. Moreover, the best-in-class 174mm of ground clearance too contributes in dealing with large potholes. At the back too, passengers will not feel the bumps filtering through as it offers a supple ride. In terms of handling, the Figo manages to challenge a series of bends with utmost enthusiasm. There is a bit of body roll but not so much that it would have you questioning the Figo’s handling capabilities. The steering though is a bit light for our liking and could do with a little more feedback. The front disc – rear drum setup gives the Figo impressive braking ability. There is enough bite and the tires support the car well, as it doesn't lose its line. All the three engine on offer claim a pretty good fuel efficiency figure. The 1.2 petrol returns 18.16kmpl while the 1.5 automatic boasts of an ARAI claimed 17kmpl. According to Ford, the 1.5-litre diesel claims a fuel economy of 25.83kmpl. 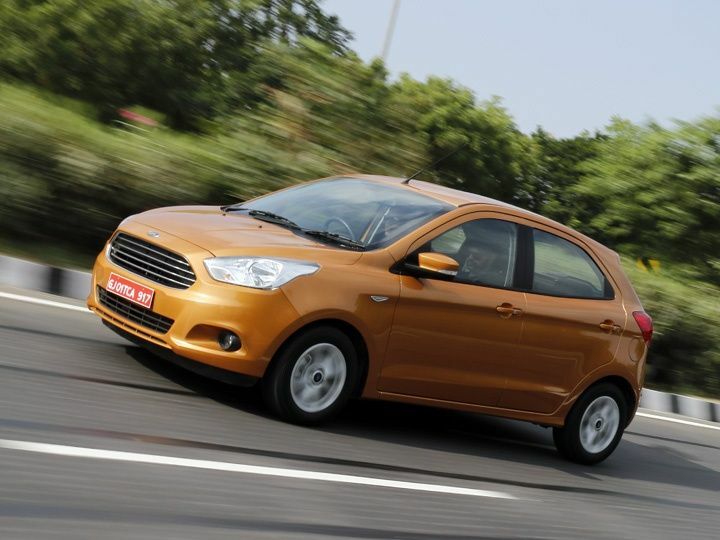 Just like the Figo Aspire, Ford has once again hit the jackpot in terms of pricing. The Blue Oval has launched the Figo at an introductory price of Rs 4.29 lakh for the base variant and Rs 6.40 lakh for the top trim. Diesel Figo ranges between Rs 5.29-7.40 lakh and the petrol automatic costs Rs 6.91 lakh. All prices ex-showroom Delhi. With this pricing, Ford has not only managed to undercut its competition but with a long list of features, it is good value for money proposition. However, it must be noted that this is just an introductory price to cash in on the festive season. Although this update is a bit late to join the party, the new Figo ticks all the right boxes in terms of features, engine and gearbox options as well as ride and handling. To add as icing to the cake, it has been priced extremely well too. And for those who worry about after sales, Ford has reduced its service call times as low as 48 hours. Wish there was some more shoulder room for passengers at the back. But as a product, the new 2015 Ford Figo repeats what its predecessor managed to achieve and that itself is quite commmendable.